Sexism and Religion: Can the Knot Be Untied? Can currently existing religion be disentangled from the misogyny of its texts, its traditions, and its practices? Sometimes I am asked how I can combine utter skepticism on religious topics with a conservative political stance, as if the two were somehow inconsistent. Here is an answer. The irreconcilable differences between libertarians and secular humanists arise in their viewpoints about government’s role in public life. We consider stories of miracles from other cultures to be fantasies, but when it comes to the Bible, even sensible people lose their critical faculties. I believe that the strongest objective evidence for greater attitudinal acceptance of death may be found in increasing cremation rates. Although faith cannot be rationally justified, this doesn’t prevent theologians from trying their best to make faith seem not only reasonable but a good thing. Have you ever noticed how fundamentally boring God is? I think that’s a slightly neglected subhead under atheism and secular humanism. Do the Best Lack All Conviction? So often, ideologues display an intensity of conviction, and an unscrupulousness in acting upon it, against which good, fair, perhaps liberal-minded people seem helpless. While people could be rational most of the time, they often don’t choose to be. This is especially true when it comes to religious faith. Did Putin say anything outrageous? Not in the least. What he said was almost platitudinous. Society is better off when exposed to arguments against the existence of a supernatural being and against the supernatural generally. 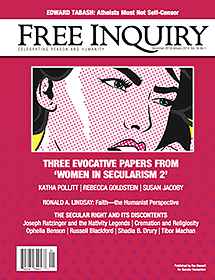 Letters in response to the October/November 2013 issue of FREE INQUIRY. Make no mistake: America’s public schools, an indispensable component of our religiously neutral (that is, secular) democracy, are under serious siege. A review of Bullspotting: Finding Facts in the Age of Misinformation, by Loren Collins. A review of Life on the Brink: Environmentalists Confront Overpopulation, edited by Philip Cafaro and Eileen Crist, with a foreword by Paul Ehrlich and Anne Ehrlich. A review of The Way of Science: Finding Truth and Meaning in a Scientific Worldview, by Dennis R. Trumble. Brief looks at a variety of books. Poetry from the December 2013/January 2014 issue of FREE INQUIRY.